How do love, respect and consent play into our relationship? When it comes to relationships, what is respect? How does consent play into daily relating? What happened to all you need is love? Through brainstorming, discussion and exploring some tools to help us track how power and control shape our relationships, we’ll dig into how we can go about creating relationships that feed and support us, while we nourish and hold down our own dear hearts. Heather will be joining us for this conversation! Heather is a sexuality educator, agitator and counsellor. With a Masters of Education focusing in Social Justice Education and Sexual Diversity Studies, and over a decade of community-based education and organizing Heather blends smarts and personality to create spaces where folks can open up and sink into their explorations. Their work is practically focused, aiming to start conversations that honour the complexity of the world around them. She’s passionate about self-exploration, transformative learning, communication, and figuring out new ways to do better. Her favourite side project is trying to taste every beer ever made — even the gross ones. Lunch will be provided. Vegan and vegetarian options are available. Everyone is welcome. This event is free. This space is accessible to wheelchairs and scooters. 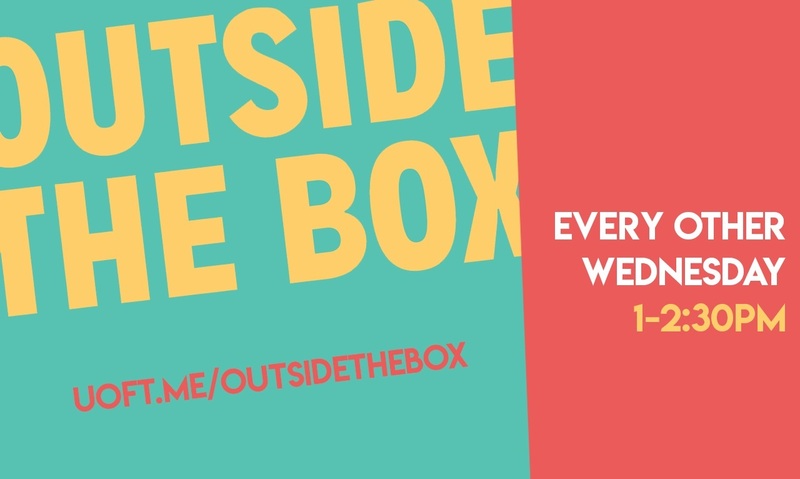 Outside the Box is a UTSC lunch and conversation series to bring students together every other Wednesday from 1:00 – 2:30 pm. Find out more about Outside the Box. This event is hosted by the UTSC Department of Student Life, and Sexual & Gender Diversity Office.